I'd be the first to admit that I'm a Malcolm Gladwell fanboy. Gladwell is a writer for the New Yorker and the author of The Tipping Point, Blink, and the upcoming Outliers. I don't always agree with what he says, or how he says it, but that makes him even more valuable to my mind. In this twenty-minute or so video from the 2008 New Yorker Conference, Gladwell talks about one of my favorite topics, measurement dysfunction (although he never uses that term) , as applied to choosing who to hire. Like everything he says or writes, it's fascinating. He talks about the the total lack of correlation between the pre-hiring evaluation and post-hiring performance of professional hockey and football players, school teachers, and lawyers. He has lots more examples that didn't fit in the time allotted for his talk. I'm sure that my various co-workers are tired of hearing me talk about how freelancing and contracting is the inevitable future employment model, and that the only thing that is holding it back now is job lock because of the lack of universal health care in the United States. There are two reasons why this is our future. Gladwell's talk is worth your time if you have any input into hiring in your organization. And even if you don't. Most people that work with me are surprised to learn that I test at the far end of the introversion scale on the Myers-Briggs Type Indicator personality test (I'm an INTJ). Since I have a reputation as a very hands-on engineer, they might also be surprised by the fact that I enjoyed taking a lot of computer science theory classes when I was in graduate school: formal languages, computability, algorithms, etc. I insist on finding practical applications for this stuff all the time. And occasionally I entertain myself by thinking about things like Gödel Numbers. In 1931, philosopher, logician, and mathematician Kurt Gödel showed how you could take any formal language and represent it as a mathematical function by encoding the symbols of the language numerically and representing the productions of the language as a function that operates on the resulting numbers. Whenever you have formal systems A and B, showing that one can be converted into the other is always a win, because it's a form of code reuse: proving something about A now also applies to B. It didn't take long to show that a Gödel number could be represented as a string that could be operated on by a Turing Machine, adding yet another formal system to the party. You can trivially apply this to any piece of software as well. Just take a core dump of your program's initial state in memory. You can think of this result as a hexadecimal representation of its Gödel number. Now take another dump of your program after every instruction executes. You end up with a series of Gödel numbers. Now write a single mathematical formula that generates this series of numbers. You have just converted your program into a abstract function amenable to all sorts of formal analysis. True, it's so large and ugly that such analysis may be intractable, but it's at least theoretically possible. Theoretical computer scientists are fond of talking about Turing Machines with infinitely long tapes. They do this mostly so that the are not constrained by physical limitations. What they really mean is "the tape is just as long as it needs to be". The fact that there are algorithms that ultimately try to march along to the end of an infinite tape is part of the fun. This is a form of the Halting Problem. We can do this with our abstract mathematical function too. We just assume we always have enough bits to represent any possible Gödel number we want to compute. An infinite number of bits should be about right. But what kind of infinity? (... -1.0, ... 0.0, 0.001, ... 0.01, ... 0.1, ... 0.2, ... 1.0, ... 2.0, ... 3.0, ...) . Cantor called the transfinite number that was the cardinality of the set of all integers ℵ0 ("aleph null") and the transfinite (but larger) number that was the cardinality of the set of all real numbers ℵ1 ("aleph one"). Since we can make a one-to-one correspondence, or enumerate, each bit in our hexadecimal Gödel number with an integer number, the number of bits in our infinitely large Gödel number is ℵ0. So how many unique Gödel numbers can we form from ℵ0 bits? That's easy for any software developer: 2ℵ0. Here's where it gets interesting (no, really). What order of infinity is 2ℵ0? It turns out, according to Cantor's continuum hypothesis, that this value is ℵ1, the cardinality of the set of all real numbers. The nature of the work I do frequently involves custom hardware and a lot of expensive diagnostic instruments. That typically precludes working from home. (Besides, when you're as lucky as I have been to work with such great people, why would you want to?) In Red, Yellow, Green Blue I described my dirt simple way of keeping stuff organized in the briefcase I schlepp around to customer sites. Now I'll describe how I keep organized while I'm working at the customer site. I spent years in academia, more years at a national laboratory rooted in academia, and years again at Bell Labs and two of its spin-offs with a long tradition in research and development. The lab notebook was a fixture at all of these places. Yet its utility wasn't apparent to me until I began freelancing. Go figure. Now I wonder how I ever lived without it. It's a tool for organization, an indispensable part of my billing process, a cache memory, and an archival storage mechanism, all rolled into a handy item that fits in a briefcase or a file cabinet. The lab notebook is traditionally a hardbound notebook with blank ruled pages, and there are still plenty of folks that use those, especially if the company is paying for them. But it can also be nothing more than the spiral bound notebook like you may have used in college. I use something in between. John Dickinson is a British company that makes a series of spiral-bound Black n' Red notebooks with plastic covers. I use them exclusively as my lab notebooks. They are sturdy and handle the occasional beverage spill. The fact that they are in my two favorite colors is just icing on the cake. Each client has their own notebook, and I label the front with the client's name and a sequential number. I typically go through a notebook every two months, more or less, on a project. Although they come in ISO standard sizes (i.e. not 8.5" x 11") they still fit in a standard file cabinet. The elastic strap riveted to the back cover keeps all my ancillary crap from falling out. I'm always collecting odd scraps of paper, notes, and odds and ends that fit nicely in the pocket at the front of the notebook. I use TUL-brand gel pens almost exclusively, which I buy in boxes of a dozen at OfficeMax. Their ink can't be easily erased, they are reliable, and (most importantly) they fit inside the spiral binding of the notebook. I make a note of the date at the start of every working day, and make a note of at least my start and stop times. I can usually reconstruct what I worked on that day, and approximately for how long, just by perusing my notes. (You may notice that the dates on these pages are over four months apart. Some projects work that way.) Symbols in the margins give me further guidance: stars are actions items and must be checked off; asterisks mark information that I am likely to need later; question marks are things I need to find out; arrows point me forwards or backwards to related information. Note that my lab notebooks are the intellectual property of my company, Digital Aggregates, not of the customer. I have never had a customer question this, but sometimes it pays to be clear. If a customer calls or e-mails me with a question, the notebook comes out of my briefcase or file cabinet. Given the occasional senior moment, I've been known to refer to my archived notebooks to remember how to do things like a Linux kernel build. In A Future Without Keyboards I mentioned that I also use a Palm T|X PDA to help stay organized. It keeps my calendar, my contact database, and a lot of notes, and I keep it synced to my ThinkPad X61 laptop. When I travel light, I carry a Nokia N810 internet tablet to keep up with email and web cruising. But I have also learned not to depend too much on anything that requires electricity. (For example, I wear a self-winding mechanical wristwatch.) Hence, the lab notebook and the paper time card, both of which have served me well. Update (March 2010): I recently replaced my Palm PDA, ThinkPad, and Nokia with a Blackberry 9630 Tour and an Apple MacBook Air. The Tour supports both CDMA and GSM standards, so it pretty much works anywhere in the world (or at least in my experience, everywhere I've gone in the U.S., Canada, and the U.K.). Plus, it serves as not only a phone, but a GPS receiver, MP3 player, digital camera, address book, date book, alarm clock, web browser, email client, and what have you. The MacBook Air is so light and thin that I have no qualms schlepping it through airports. I still use the Nokia for motorcycle trips, though. Update (December 2012): Some years ago I replaced my Tour with a Blackberry Bold, and just recently the Bold with an iPhone 5. I still have the Air, but when I travel I typically take an iPad unless I know I'm going to have to do a lot of content generation. I chose the iPad model with a cellular modem partly because the cellular chip set includes true GPS support. Now that I have the iPhone, my next iPad may just be the WiFi model. Update (2016-07-26): Lots of changes over the past four years: I still have my iPhone 5, but my laptop is a 13" MacBook Pro, and I'm on my second iPad. One of the most useful upgrades I did was to my daily writing implements. One morning I picked up a gel pen on my desk and it had dried up -- a persistent problem with gel pens, regardless of the brand, in my experience. I picked up another: the same. Another. And another. Finally I got on Amazon.com and ordered a batch of Fisher Space Pens. They make many different models, all refillable with the same refills. Plus, they make refills compatible with Cross ball point pens, so you can use that nice gold pen you got as a gift. That's exactly what I've done. 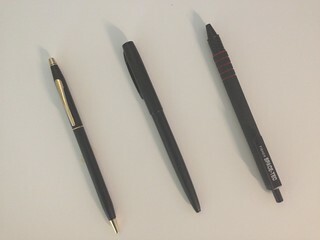 Below is a photograph of three different pens I had immediately at hand: the Cross pen I keep in my shirt pocket, the Fisher metal-body tactical pen I keep in my current project notebook, and a Fisher Space-Tec plastic-body pen I keep in a small notebook in my briefcase. The pens and refills are rock solid reliable, they write smoothly, and the refills last nearly forever. If it works for the astronauts, it'll work for you.